This was for my friend Maria's challenge on using ribbons in 2 places or more. Here you see the organza poolkadotted ribbon in the front and 3 pieces of velvet ribbon on the right side of the card next to the 3 brads. (hard to see from this picture). This card looks complicated, but it was actually very simple. 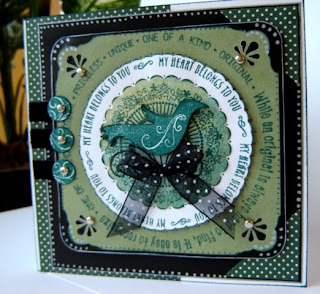 Stamps used: CTMH - Free Spirit D1217 & CTMH Endless Love D1260. Hey America! I love how you explained how your card was made. I just realized now that you had stamped the "Endless Love" image! LOL! There's a stamper on SCS that loves to doodle her dots too. Her name is Faith. . .I believe her SCS name is MarkiesMom. . .or something like that. She doodles the dots on all her cards like you do!! I love all your dots! I think it takes a lot of patience! !